We’d love your help. Let us know what’s wrong with this preview of Beyond Charity by John M. Perkins. To ask other readers questions about Beyond Charity, please sign up. Dr. John Perkins is a living legend. He's the closest thing there is to an expert in Christian Community Development. This book is centered on the Gospel & our response to it. What a blessing it is to hear from this Godly man. Perhaps the most impressive part of this book is that it was first published in 1993. Without constantly remembering that date, the content would lead me to believe that it was written this year. The concepts are timeless and clear. Twenty-five years later, the material in this book is as needed as ever. John Perkins is the father of the Christian Community Development movement, and in a way, this book is its constitution. It will prove to be useful to anyone seeking to serve the urban poor in Perhaps the most impressive part of this book is that it was first published in 1993. Without constantly remembering that date, the content would lead me to believe that it was written this year. The concepts are timeless and clear. Twenty-five years later, the material in this book is as needed as ever. John Perkins is the father of the Christian Community Development movement, and in a way, this book is its constitution. It will prove to be useful to anyone seeking to serve the urban poor in an effective, biblical way. This was a very good book to tell the Christian how to put feet to their Christianity. My only problem with the book was that he did not stress that good works does not assure the believer a place in heaven. Salvation is for the believer who accepts the work Jesus did on the cross and not any good works that a person does.This is a good book to tell the social gospel story. I could not go live in a ghetto to share the gospel with unbelievers but I admire those who make this choice. my favorite quote from this book is: "take the risk, swallow doubt, and move forward." Wonderful book. Although 20 years old, this book's recommendations are fresh and relevant. Dr. Perkins is a Christian dedicated to helping the urban poor. He has long experience and much wisdom to share. Inspiring. I appreciated this book so much I did a five-part series of blog posts on it. Perkins opens this book by recalling the aftermath of the acquittal of four white officers after the beating of Rodney King in LA. The year was 1992. Fast forward to 2015. We as a nation have been watching Ferguson, MO as people have responded to the acquittal of a white officer who killed a young black male named Michael Brown. Perkins believe these are spiritual issues that need spiritual solutions. Perkins words are just as timely today as they were in 1993. A must read for all Christians, especially those concerned with confronting poverty and serving and developing under-served communities. Challenges conventional notions of giving ("charity") and replaces ineffective, self-aggrandizing, and marginalizing practices with a more genuine investment, personal involvement and holistic solutions. For theological conservatives concerned with a so-called "social gospel", Perkins provides a balanced theological approach to social action. Who doesn't love John Perkins? The man is amazing, and I've had the opportunity to hear him speak several times. Having seen him in action, I'm fully aware that he is not the author of this book, and that lack of integrity disturbs me. I understand that the ghost writing profession is a lucrative career for many, but at the very least, the supposed author should make a point to note assistance. Almost done. This book is a real challenge to the complacency, hippocracy and indolence of the American Church. Perkins points out many of the problems and legacies that the Church has to deal with in order to be an effective positive force in our society. If you find yourself reflexively disagreeing it may be because you are scared of the implications if Perkins is right. A great book about moving from charity to empowerment from a guy who knows what he's talking about. Make sure you read it all the way through to get to the part about all the adversity Perkins has endured in his work...it will leave you in awe at his enduring sense of hope. This book has a little more abstract theology than I was expecting, but it all applies to the topic. 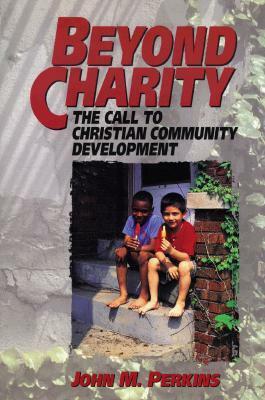 This is a great book for understanding community development and the real need to give of yourself and your pocketbook. A classic work in the field of community development -my husband's field.